Lateral femoral cutaneous neve is part of the peripheral nervous system or peripheral nerve. The peripheral nervous system consists of 43 pairs of motor and sensory nerves. These nerves and motor connect the central nervous system to the entire body. The central nervous system consists of the brain and spinal cord. Sensory nerves control sensation, motor coordination and movement functions. This article discusses the lateral femoral cutaneous nerve, its disorders, and treatment options. and posterior branches. The branches penetrate your fascia lata and contribute to terminal cutaneous branches. They are located 8-10cm below the spine. The anterior branch contains all L3 fibres and supplies the skin in the anterior and lateral parts of your thigh to the knee. The anterior branch has two terminal branches that extend to the patellar plexus. The posterior branch contains L2 fibres of the nerve and supplies the lateral and posterior parts of your thigh to mid-thigh. The lateral part found in your thigh extends from the greater trochanter in the hip. Meralgia paresthetica refers to the lateral femoral cutaneous nervecompression, also known as paraesthetica in the UK. It causes a tingling sensation and numbness in external part of your thigh. It usually is a burning ache in or on the surface of the lateral part of your thigh. The symptoms of meralgia paresthetica manifest on one part of your body. They intensify after a time of walking or even standing. This condition is often confused with other nerve disorders such as femoral or sciatic pain and nerve root impingements. Any condition that exerts weight on your groin may cause meralgia paresthetica. The lateral femoral cutaneous nerve passes through the groin. Obesity and pregnancy: The excess weight in individuals with obesity and the additional weight during pregnancy are likely to compress the nerve. Tight clothes including belts, tight pants, and corsets increase pain on your groin. A heavy tool belt can compress the nerve as well. Diabetes and seal belt injuries from a motor vehicle accident may cause meralgia paresthetica. Scar tissue near the inguinal ligament: An individual is prone to meralgia paresthetica if he or she hasscar tissue near the inguinal ligament. Scar tissue may result from an injury or surgery. Age: People between the age of 30 and 60 years are prone to suffering from meralgia paresthetica. These treatment options are effective in many meralgia paresthetica cases. They include wearing loosely fitting clothes and losing excess weight. Another conservative measure is taking OTC pain relievers including aspirin, acetaminophen or Tyneno, and ibruprofen such as Advil and Motrin IB. Corticosteroid injections relieve pain and reduce inflammation. Their side effects include nerve harm, joint infections, pain, and a whitish skin around the site of injection. Tricyclic antidepressants relieve pain and their side effects include drowsiness, a dry mouth, poor sexual function, and constipation. Some anti-seizure medications such as gabapentin or neurontin, pregabalin or lyrica, and phenytoin or Dilantin can relieve symptoms. Their side effects include nausea, drowsiness, dizziness, constipation, and lightheadedness. Surgery to decompress this nerve is taken into account at times when patients have severe and long-lasting symptoms. The lateral femoral cutaneous nerve block helps doctors evaluate and manage pain in the lateral part found in your thigh. It is combined with local anesthetic and steroids to treat persistent pain. 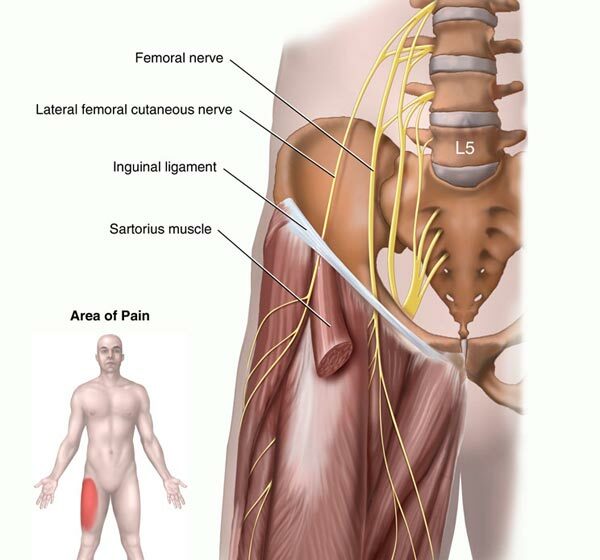 This pain is sometimes an indication that the lateral femoral cutaneous nerve is inflamed or trapped. To help with the condition, build your strength and improve your flexibility to reduce hip tightness. Bridging is a hip exercise in which you lie flat on the floor and lift your bottom up as you tighten your gluteal muscles. Perform hip extensions by lying on your belly and lifting your leg up as you tighten your gluteal muscles. For a standing hip abduction, stand upright and slowly lift each leg to one side while keeping the knee straight. These exercises do not cause any pain on the thighs. Stretching quadriceps muscles improves flexibility and strength of the upper thigh. To stretch the muscles, pull the heel of your foot backwards towards your hips while standing. Stretch the upper thigh as you pull your heel. Discontinue the exercise if you feel any pain. Stand upright and step forward with one foot as you lower your body until the opposite knee touches the ground at a right angle. Reverse the exercise or alternate with the other leg.